Thank you so much for a nice product. I am very satisfied with your product, PUREEFFECT CLASSIC (Countertop). It is easy to build, good quality water filter and reasonable price. It is a big help that we don't have to ask a specialist to build a filter. The function to remove radiation is such a help for my family. Reasonable price allows me to get one of your products. I rate 4 stars for build quality because water leaked from the joint part at the beginning. But it doesn't any more. 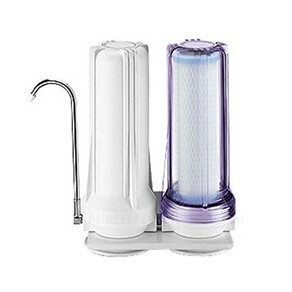 I found the similar water filter in the internet in about 3 times more price. My city does not fluoridate the water supply so I chose this model. This makes more sense than buying something like a brita or mavia jug style filter system. I just planted the unit right above my kitchen sink to produce all my cooking and drinking water. This water tastes clean and UN-chlorinated. When I hold a glass to the light, there are no strange things floating in it. The unit is well constructed and easy to install, the supplied instructions are clear. Fantastic,could give it 10 stars! Love the filter. Super easy to install and great peace of mind having it. Highly recommend it to my friends.